Step 4: Compiling and sending to your Particle board. 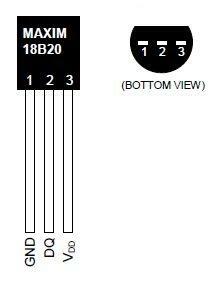 This tutorial will introduce you to the basics of reading values from a DS18B20 Temperature Sensor. This sensor is known as a 1-Wire digital temperature sensor. The 1-wire refers to the way in which you talk to the sensor and get information from it. This ‘family’ of sensors uses a specific protocol for how you get information from it. This means we need some special libraries to add to the ways our Particle device can interact with sensors. You’ll need to download both from GitHub and copy the .cpp and .h files from the firmware folder to your project folder. The sensor itself is pretty easy to wire up. You’ll notice is has three pins - one for power, one for ground and one for data (we read from this). We wire the digital signal pin to a digital pin on the Particle board. Look at the diagram below. Keeping the flat face towards you wire the left pin to ground, the middle pin to your Digital pins, and the right leg to power (3v3). If you’re using the sealed temperature sensor in the kit the wiring is pretty similar. Red wire to power; black wire to ground; yellow wire to digital! Finally, when you’re wiring the DS18B20 you need to add a pull-up resistor. Ideally use a 4.7 Ohm resistor (yellow, purple, red) but a 10K (Brown, Black, Orange) will do if that’s all you have. This is wired between the digital signal and power pin. The DS18B20 is an easy to use one wire digital thermometer with up to 12-bit measurement resolution. The DS18B20 looks virtually identical to the NPN Transistor provided in the kits. Be sure not to confuse them - to make sure you have the right one, check the top right corner of the flat face. The temperature sensor must be correctly wired or you will permanently damage the chip. To wire it correctly, hold it with the flat face towards you. The left terminal (leg) should be wired to power (3V3). The right leg should be wired to ground (GND). Do not mix them up. If you do, the chip will become extremely hot, it will become damaged and either give you no readings or incorrect values. Ideally, the sensor should be placed away from the Particle board so that the heat dissipated by the board does not affect the temperature readings. You’ll need to download and include two libraries for this code to work 1) the OneWire library and 2) the Spark Dallas Temperature Library. Include both in the same directory as your project. Let’s take a look at the code and explain it. // This #include statement was automatically added by the Particle Build IDE. The sketch starts by including the two needed libraries - OneWire and DallasTemperature. Then, it declaring that the temperature sensor will use OneWire to read sensor values on pin D0 and sets the DallasTemperature library to use this configuration of OneWire. Finally, it says we will use two double (decimal type) variables to store the celcius and farenheit temperature readings. Each time the loop function is called it first reads the value from our sensor and stores it in a double variable. We store the celsius range in the variable named temperature, quickly convert to fahrenheit, and we’re done! Make sure the Status Bar has a device connected and the device’s indicator is breathing blue. If not make sure your device is connected by USB and is getting a WiFi signal.